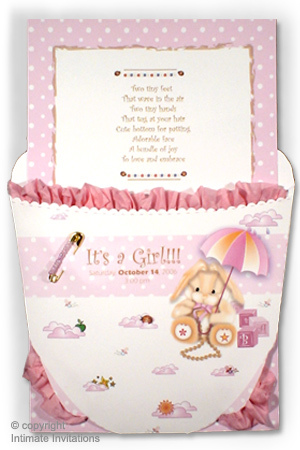 The diaper is decorated with sports, princess, rocking horse, carousel or another theme of your choice. The diaper has hand ruffled tissue paper and a handmade beaded safety pin. This is a two part invitation; the diaper envelope, the insert card and the mailing envelope. It is completely customizable to your taste and preference with your own text in the language of your preference. The card insert has a border and continues with the theme and the color. The card insert text will be replaced with your own. 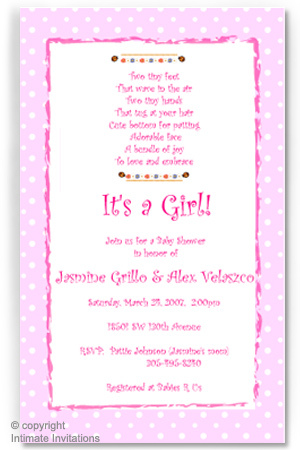 All the graphics and the fonts are customizable You can choose background Color, accents color, font face and font color. For the text, you can have any wording you like. Soon after you make your payment we will email instructions to your payment email account in which we will ask you to send us your text and your preferences. 1-2 business days after we recieve your complete information, we will send you via email a digital proof of your customized intimate invitation with your text in place and you selected choices. You will have to approve the attached proof via email in order for us to start printing and handcrafting your order. Depending on the quantity that you order, it could take up to 10 business days for your order to be ready for shipping. We also have in the same series place cards, thank you Cards, Tags, Scramble Game sheets, Advice Cards and stickers in all sizes or any other favors you may need for your intimate event, just email us your request. These invitations are adorable and unique.